Founded in 1982 by brothers Paul and Dennis Dykstra and sister-in-law Linda Dysktra, our locally owned business is one of the largest Garden Center and Landscaping companies in eastern lowa. Founded in 1982 by brothers Paul and Dennis Dykstra and sister-in-law Linda Dykstra, our locally owned business is one of the largest of its kind in Eastern Iowa. We are advocates of nature. We hope that we have created a place where you can add both beauty and value to your home and your life. Our staff shares a passion for plants and for nature, working together for the common goal of making our business, and our community, the best that it can be. First located at 720 Hwy 1 West, currently the site of the Aldi Grocery Store, we soon outgrew the small space. The demand for quality landscaping services and plants sent us searching for a new home. We soon found it right across the street, in a property that had been occupied by the DOT. Paul drove to Ames to deliver our sealed bid, stopping at a pay phone to deliver the good news to his partners. After a major remodeling project that involved completely gutting and re-fitting the interior of the building, our current Garden Center was born. The old metal ceilings are still visible in the break room and storage area of the store. The growing pains continued, and we added a storage building in 1992, and office space to the upstairs of the building in 1996. 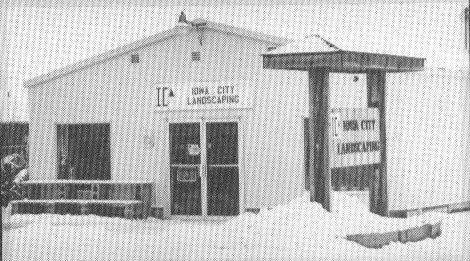 In 2000 we purchased several acres on Herbert Hoover Hwy on the east side of Iowa City and relocated our landscaping design and construction operation, leaving the retail business on Hwy 1. The biggest change of all came in March of 2012, when our founding partner and president Paul Dykstra lost his battle with pancreatic cancer. This left a hole in our business, our hearts, and all across the community that knew him. A lot of very fine people have come and gone in the 30+ years we have been in business, and now we find ourselves employing some of their children – we have always been, and remain a “family” business. and to provide the best possible results for the people we do business with. We are committed to doing what is right for our customers, and showing them our appreciation. We do our best to be positive and sincere, and treat our customers and each other with respect. We understand the concept of being part of a team. We are committed to caring about and supporting activities in the communities in which we live. We are committed to operating our business in a way that minimizes adverse effects on our environment. Through projects like the Kindergarten Tree Program, we have always tried to be involved and active members of our community. We encourage our staff to be active in their communities, and support these endeavors as well. If you would like Iowa City Landscaping to Donate to your next fundraiser, please click HERE to fill out our donation form.